ONLINE SCHEDULING: FOR RETURNING PATIENTS ONLY. If you are a new patient OR have never used the online scheduler before YOU MUST call us first for info on how to access this feature. Creating your own profile will NOT allow you to self-schedule and can result in duplicate profiles. IN PERSON: You can always book future appointments when you are here for treatment. BY PHONE: 401-272-2288. Be sure to let us know whether you are a Returning Patient or a New Patient when you call. Leave a message if we don’t pick up and we will call you back. You will need a user name and password to use the online scheduler. If you’ve forgotten your password, there is a password reset link, or if you still need help give us a call. After you log in with your username and password: select a date on the calendar, scroll to see the available times, click on a time slot marked RESERVE, and confirm with a YES when prompted. That’s it! You can ONLY make an appointment for yourself. To book an appointment online for someone else, please use their username and their password to do this. If you want to use the online scheduler, but don’t have an email address, speak to someone at our front desk, they can help. 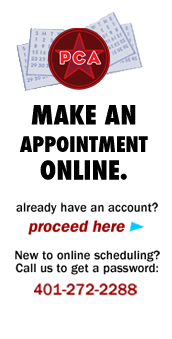 The online scheduler will not allow you to change or cancel within 24 hours of your appointment time. Please call us instead; leave a message if it’s after-hours or we don’t pick up. A Missed Appointment Fee of $15 may be charged with less than 24 hours notice. New Patient appointments can only be made by phone, or in person. We do not schedule or cancel appointments via email ever. SAME DAY and Walk-In APPOINTMENTS. We often have room in our schedule for same-day appointments for Returning Patients, and sometimes for New Patients too. Call us! As a walk-in, you may have to wait as long as 30 minutes before being seen, as those patients who do have appointments will be treated first. We usually cannot accommodate New Patients as walk-ins. BRINGING A FRIEND or FAMILY MEMBER? Let us know if that person is a Returning Patient or a New Patient. We block out certain times of day for New Patients. We will need your friend or family member’s full name, phone number, and date of birth and availability in order to schedule them an appointment. Patient confidentiality requires that we do not give out appointment information to 2nd parties unless permission has been given.